It is ORDERED that the time for filing the certified record is extended to April 1, 2015. Lemme see if I got this. Lek Securities has appealed some Financial Industry Regulatory Authority ("FINRA") regulatory matter to SEC. As to what the appealed-from FINRA matter is, we are not told in the SEC Order. You'd think that the SEC would have provided us with some content and context so that we knew just what the hell was going on but, hey, all that I can do is rant. SIDE BAR: Could it be one of these FINRA matters being appealed to the SEC? Lek Securities Corporation (CRD #33135, New York, New York) was censured and fined &dollar;100,000. The sanctions were based on findings that the firm failed to establish and implement AML policies and procedures, and internal controls that could be reasonably expected to detect and cause the reporting of suspicious transactions and that were reasonably designed to achieve compliance with the Bank Secrecy Act and the implementing regulations promulgated by the Department of the Treasury. The findings stated that the firm depended upon an ad hoc, undocumented, manual system of surveillance for potential wash trades and other types of manipulative activities that was inadequate in the high-volume electronic trading environment in which the firm operated. Although the firm later instituted new surveillance procedures and mechanisms, its approach to its AML responsibilities remained inadequate in design and implementation since it did not document the actual review, investigation and determination with respect to any particular potential suspicious trading, and did not specify the procedures for investigating suspicious trading and determining whether a suspicious activity report (SAR) should be filed. The findings also stated that the Department of Enforcement failed to prove that the firm's supervisory systems and WSPs relating to portfolio margining for a particular customer violated NASD�/FINRA rules. As a result, that allegation was dismissed. This matter has been appealed to the NAC and the sanctions are not in effect pending review. (FINRA Case #2009020941801). The Respondent Firm failed to establish and implement anti-money laundering policies and procedures that were reasonably designed to achieve compliance with the Bank Secrecy Act and the implementing regulations promulgated by the Department of the Treasury. This misconduct violated NASD Conduct Rules 3011(a) and 2110 and FINRA Rules 3310(a) and 2010, as alleged in the First Cause of Action. For this misconduct, the Firm is censured, fmed &dollar;100,000, and ordered to pay costs. The Department of Enforcement failed to prove that Respondents' supervisory systems and written supervisory procedures relating to portfolio margining for a particular customer violated NASD Conduct Rules 3010 and 2110 and FINRA Rule 2010, as alleged in the Second Cause of Action. That Cause ofAction is dismissed. In any event, here's what's bothering me. When a Respondent in a FINRA regulatory hearing is found guilty, the self-regulatory organization ("SRO") imposes sanctions, which frequently include the costs of the administration of the hearing and the cost of the transcript. Normally, inherent in those charges is the cost of preparing the ongoing record of the case. The reason that a record is prepared is to provide something for an appellate body (regulators and/or courts) to review should a decision be appealed. In this day and age, preparing a record isn't quite the ordeal that it used to be. With all the PDFing and MP3ing that has taken over so much of hard-copy content and oral testimony, it's more a question of assembling digital files rather than the old-fashioned photocopying and transcribing tapes. For failing to establish and implement anti-money laundering policies and procedures that were reasonably designed to achieve compliance with the Bank Secrecy Act and its implementing regulations, in violation of NASD Conduct Rules 3011(a) and 2110 and FINRA Rules 3310(a) and 2010, as alleged in the First Cause of Action, Lek Securities Corporation is censured, fined &dollar;100,000, and ordered to pay costs. The costs are in the amount of &dollar;14776.34, which includes a &dollar;750 administrative fee and the cost of the transcript.184 The fine and assessed costs shall be due on a date set by FINRA, but not sooner than thirty days after this decision becomes FINRA's final disciplinary action in this proceeding. Rule 420. Appeal of Determinations by Self-Regulatory Organizations. (iii) prohibition or limitation in respect to access to services offered by that self-regulatory organization or a member thereof; or (iv) bar from association as to which a notice is required to be filed with the Commission pursuant to Section 19(d)(1) of the Exchange Act, 15 U.S.C. 78s(d)(1). (b) Procedure. As required by section 19(d)(1) of the Securities Exchange Act of 1934, 15 U.S.C. 78s(d)(1), an applicant must file an application for review with the Commission within 30 days after the notice of the determination is filed with the Commission and received by the aggrieved person applying for review. The Commission will not extend this 30-day period, absent a showing of extraordinary circumstances. This rule is the exclusive remedy for seeking an extension of the 30-day period. (c) Application. The application shall be filed with the Commission pursuant to Rule 151. The applicant shall serve the application on the self-regulatory organization. The application shall identify the determination complained of and set forth in summary form a brief statement of the alleged errors in the determination and supporting reasons therefor. The application shall state an 8 address where the applicant can be served. The application should not exceed two pages in length. If the applicant will be represented by a representative, the application shall be accompanied by the notice of appearance required by Rule 102(d). (d) Determination Not Stayed. Filing an application for review with the Commission pursuant to paragraph (b) of this rule shall not operate as a stay of the complained of determination made by the self-regulatory organization unless the Commission otherwise orders either pursuant to a motion filed in accordance with Rule 401 or on its own motion. (e) Certification of the Record; Service of the Index. Fourteen days after receipt of an application for review or a Commission order for review, the self regulatory organization shall certify and file with the Commission one copy of the record upon which the action complained of was taken, and shall file with the Commission three copies of an index to such record, and shall serve upon each party one copy of the index. Imagine that you are an aggrieved FINRA Respondent and intend to appeal to the SEC. The SEC Rules of Practice isn't exactly all warm and bubbly concerning your deadline. You got 30-days from notice of FINRA's determination. Trust me (and you can look it up), if you don't file within the 30-days, FINRA will be all up your . . . well, you can imagine. Also, note how inflexible the SEC is in terms of any excuses for a late appeal: The Commission will not extend this 30-day period, absent a showing of extraordinary circumstances. Even if Lenahan had exhausted her administrative remedies, we must dismiss her application for review because it was untimely. Under Section 19(d)(2) of the Securities Exchange Act of 1934, an applicant has thirty days to submit an application to the Commission for review of a disciplinary action imposed by a self-regulatory organization. 11 Lenahan's application was due October 25, 2012, but she waited until April 10, 2014, to file. Only in extraordinary circumstances does the Commission provide an exception for late filings, 12 and Lenahan has failed to show any extraordinary circumstances here. 13 Her professed ignorance of the bar's consequences and alleged reliance on advice from a FINRA examiner-the only reasons she offers for the untimeliness of her application-do not constitute extraordinary circumstances that would excuse her late filing.14 Lenahan's application is thus properly dismissed on this ground as well. About the only obligation imposed upon FINRA under the SEC Rules of Practice as part of the preliminary filing of a respondent's appeal with the SEC is that 14 days after the federal regulator gets the appeal, the self-regulatory organization shall certify and file with the Commission one copy of the record upon which the action complained of was taken, and shall file with the Commission three copies of an index to such record, and shall serve upon each party one copy of the index. Keeping the SEC Rules of Practice in mind, we are informed by the federal regulator that FINRA didn't maintain the "voluminous" record of the Lek hearing. Why didn't the SRO maintain the file -- which it is required to do and for which it likely charged the Respondent? Why does the SEC Order use the term "voluminous" -- I see no reference to "minimal" or "voluminous" files in SEC Rule of Practice 420(e). Further, assuming that Lek Securities was charged hearing and transcript costs by FINRA, how is it that FINRA took the money but, gee, didn't maintain the record? What the hell happened to and where the hell did 15,000 pages disappear to -- or were they not maintained in the first place? Then there's that really troubling comment in the SEC's release that: It appears appropriate, however, to grant FINRA's request. That's the standard for adjudicating the inability of FINRA to timely file a record on appeal? The SEC now gets all touchy-feely when it comes to FINRA and if the SEC's Secretary (mind you, apparently not an Administrative Law Judge) deems it "appropriate" to release the SRO from compliance with a basic obligation under SEC Rule of Practice 420, then, so be it? Note that there's nary a word as to what was presented by FINRA in support of its request for an extension and there's nary a word as to what was deemed the persuasive factor(s). Assuming turnaround is fairplay, what exactly were the "extraordinary circumstances" presented by FINRA to the SEC in support of the self-regulator's failure to timely certify the record within the 14-day period proscribed in Rule 420? Assuming the disclosure of that explanation would not constitute divulging a matter of national security, on what basis is the rationale for granting the extension not required to be disclosed in the SEC's published Order? The other day I reported about a FINRA regulatory matter that had been appealed to the SEC: "The Amazing Mobius Strip Of Wall Street Regulation" (BrokeAndBroker.com Blog, March 18, 2015). 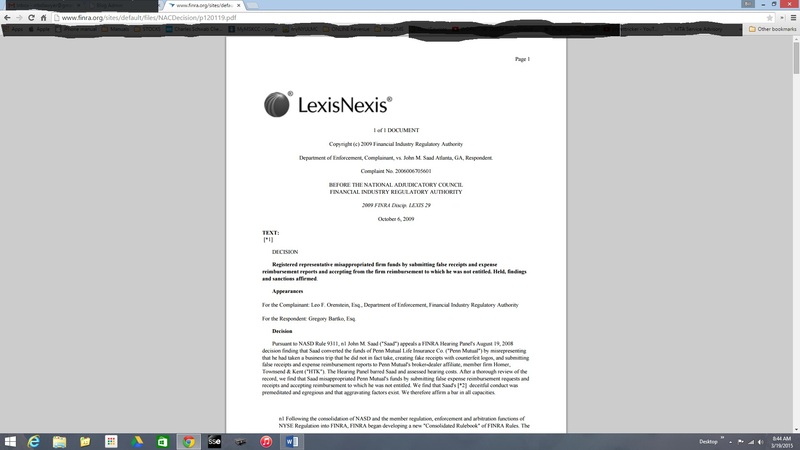 In researching that article about Respondent Saad, I kept looking for FINRA's official copy of the relevant National Adjudicatory Council Decision but for some odd reason, all that the FINRA had posted online was a LexisNexis copy of that document -- something that I don't recall seeing in the past. Is FINRA missing more than just a single 15,000 page record? Hopefully, Commissioner Gallagher will take a look into the circumstances regarding FINRA's failure to meet SEC Rule of Practice 420's 14-day deadline, and the whole issue about the 15,000 pages. If nothing else, the SEC should offer more content and context when publishing Orders about such extensions of its deadlines based upon purportedly "extraordinary" reasons cited by an SRO.